How can scientists follow individual cells or animals through space and time within a large population? Being able to do this would be very insightful, allowing us to elucidare the behaviour of individual components of a system and provide insight into the mechanisms of biological processes. For example, we could watch the fate of individual cells as an embryo develops and the cells become specialised. But keeping track of the progress of numerous individuals in a complex biological sample is not easy How can we be sure we are observing the exactly the same individual animal (or cell)? This paper helps to address that problem. It reports an elegant method in which individual animals are labelled with a ‘barcode’, distinguishing them from the rest of the population. 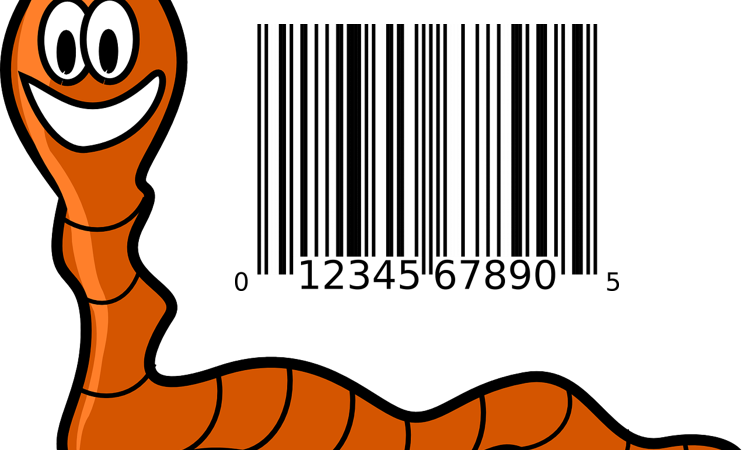 The barcode, which is made and read photochemically, is harmless to the animals (nematodes were used as a test) and allows them to be tracked without altering their behaviour. The barcode works by combining three different fluorescent molecules (fluorophores) together. Each fluorophore fluoresces at a different wavelength, so a fluorescence microscope can tell them apart. To simplify matters, the three fluorophores are very closely related, structurally and synthetically. The trio, shown below in Figure 1, result from two successive photochemical reactions. Visible light irradiation of fluorophore 1 results in the production of a second fluorophore, 2, which emits a longer wavelength of fluorescent light than 1. In turn, fluorophore 2 can be converted into 3, with the emission moving to a longer wavelength still. The emission wavelengths change because the system of conjugated π-electrons is extended by each reaction. By simply irradiating a single compound, fluorophore 1, amixture of three fluorophores is generated. Figure 1: The three fluorescent molecules (fluorophores) 1, 2 and 3 have different fluorescent properties because of the sizes of their conjugated π-systems. Reprinted with permission from J. Am. Chem. Soc., 2018,140, 4485−4488. Copyright (2018) American Chemical Society. By varying the amount of irradiation, the US-based research team can control the relative amounts of 1, 2 and 3 present in the sample. Changing this mixture gives a different fluorescence signal, because of the different fluorescence wavelengths of 1, 2 and 3. This opens up access to a range of different fluorescent labels that can be distinguished from each other using the fluorescence microscope. To illustrate how their technology can be used, the authors labelled nematode worms. They did this by impregnating tiny polystyrene beads with fluorophore 1. The fluorescent beads can then be taken up by the nematodes. Then the researchers shine light on the nematodes, which converts fluorophore 1 into the desired mixture of 1, 2 and 3, thereby labelling it with the barcode. Figure 2 shows how parts of the same nematode were given different barcodes by irradiating for differing amounts of time. The histograms show how the intensity from fluorescence of compounds 1 (green), 2 (red) and 3 (blue) is different for each barcode. Notice that the profiles of each barcode also stay the same over time. In the fluorescence microscopy images, you can see that the location of barcode 2 move around over time as the labelled beads move around in the intestinal tract of the nematode. This experiment serves as a demonstration of how the fluorescent barcodes can be used to track targets in space and time. Figure 2: Labelling of a nematode with three different barcodes, showing how the fluorescent beads move in time. Reprinted with permission from J. Am. Chem. Soc., 2018,140, 4485−4488. Copyright (2018) American Chemical Society. In the future, labelling of cells (and perhaps eventually even single biological molecules) with unique barcodes may become a common part of the imaging ‘toolkit’, allowing individual components within a complex biological system to be tracked over time. Although this method has not yet been used to solve a biological problem, its introduction could prove to be a highly useful tool for students of biological processes. These results could well be the starting point for a powerful and insightful technique.